October 23, 2015 October 23, 2015 Lisa A. 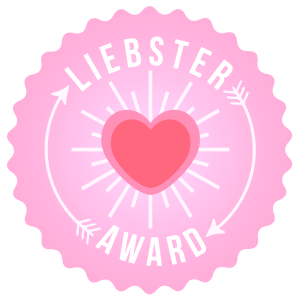 Thank you to Terry for nominating me for the Liebster Award! I invite you to read/follow Terry’s blog! Mention and thank the blogger that nominated you. Add a link to their blog. Create 11 questions your nominees to answer. Notify your nominees of their Leibster Award. 1. If you could live anywhere in the world where would it be ? I enjoy where I live a lot. If money or weather weren’t an issue, I would pick Rome or Orlando. 2. What are most proud of ? I’m proud of being one of the first women in my family to graduate from college. I was also a single mom for years. I’m lucky my boyfriend and family help me with my son. 3. Where do you live? El Paso, Texas. 4. Have you ever seen a ghost? No, I haven’t but I’ve experienced weird things in our home, especially when my boyfriend’s grandma passed away. 5. What is your all time favorite book? I like so many books but I’ll say Angela’s Ashes by Frank McCourt. 6. If you could say something to someone who has left this world what would it be? I love you! 7. Have you ever had Sushi? Yes and I don’t like it at all. I got food poisoning from it the first time I ate it. 8. What is your all time favorite movie? Ohh, this is a hard question because I like so many! I’ll say Rocky. I also like Angela’s Ashes. 9. How many siblings do you have? Two. 10. What do you do for a living when not blogging? I sell print and online advertising for the daily newspaper here. I’m also a mom. 11. What is something you want to accomplish before you leave this world? Write a book, travel a lot more, help more people. Tell us about your best friend? If you cook, what is your specialty dish? What do you like wearing the most? What was the best movie you saw this year? What are some family traditions you have? Congratulations on your Leibster Award! Thank you! 🙂 Congratulations to you too! Thanks for nominating me. I will soon respond! Hi! Thank you for your comment and for following my blog 🙂 Angela ‘ s Ashes will always be a favorite book and movie for me! You feel so many different emotions while reading and watching the movie. Angela’s Ashes. Wow, what a powerful story. And what an intro. Thank you for the award! 🙂 It’s a memoir about a boy who grows up in Ireland and then moves to New York City. Have a great day too! Thank you for answering my questions. This was fun. I have never read “Angela’s Ashes”. Have a great day.